Off-shore wind farms are used to generate electricity. Underwater cables connect the wind turbines to the national grid back on land. The cables are laid using underwater machines. 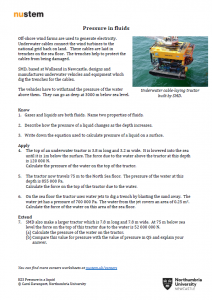 This worksheet builds on students’ knowledge of pressure in a liquid in the context of working underwater.